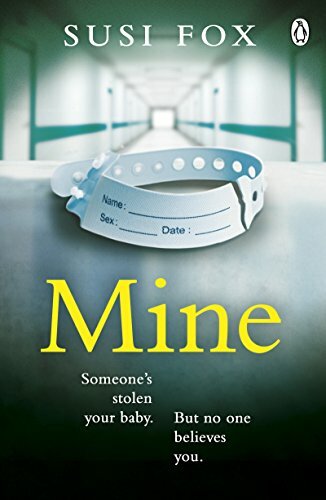 ‘Mine’ is the latest book by Susi Fox. You wake up alone after an emergency caesarean, dying to see your child. But when you are shown the infant, you just know. This baby is not yours. No one believes you. They say you’re delusional, confused, dangerous. But you’re a doctor. Do you trust yourself? Because you know only one thing – You must find your baby. Mine is an intoxicating thriller, that will keep the reader hooked throughout. The story is primarily seen through the narrative of Sasha, a first time mother who has finally given birth after years of trying. This should be a happy time for her and her husband Dan, but Sasha is convinced that the baby she is told is hers is actually not and so ensues a story of investigation, doubt and paranoia. The story starts just as Sasha wakes up after an emergency caesarean, Sasha is confused and desperate to see her little girl but when she is presented with a baby boy instead, she is convinced that the baby is not hers and is determined to find her baby. Sasha is a doctor and is aware of circumstances can change during the pregnancy, but no matter how many times she is told the boy is hers, Sasha declares otherwise. ‘Mine’ is cleverly written, it’s written in both the past and present tense, both through the narrative of Sasha and Dan and gives an interesting insight into their relationship. Their first meeting, their history and just how much their desire to have a baby consumed their relationship. Right from the very beginning the story is dark and claustrophobic, set primarily within the confines of the hospital, what should be a happy moment for the couple is instead riddled with sadness and suspicion. The story is a rollercoaster right from the very beginning, I found myself urging Sasha to bond with her little boy and other times, with suspicious characters and situations, began to wonder if Sasha could potentially be right, and it’s not all in her head like everyone suspects. A chilling tale about the dark side of motherhood, this book is an intense story where everyone is a suspect. Creepy and scarily believable, ‘Mine’ will leave you breathless when you reach the final page. You can buy Mine from Amazon and is available to buy from good bookshops.